I was contacted by a researcher for a network survival show regarding Daniel Boone Era survival skills. In my own research to gather appropriate material I came across this traditional instrument crafted by hunters over past centuries if not millennium. 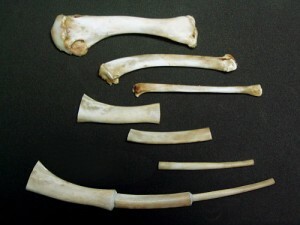 It is made with the three bones found in a turkey wing. It reminds me of flint and steel fire making where you have to make charcloth (requiring fire) before you can make a fire using that method. You’ll have to acquire the bones to make a call before you can lure in a turkey to shoot. Primitive crafts traditionally use primitive tools, materials and methods, but if you understand the construction process, you can speed up the process with modern day counter counterparts. This is the path that I chose while constructing the wing bone turkey call that is illustrated in the photo. I used the cooked bones from my Thanksgiving Dinner turkey. After cleaning off the meat, I used a band-saw to cut the knobby ends off. I suppose that a hacksaw or multi-tool saw would work too. Next I cleaned out the bone marrow using a break-off blade utility knife and a “Hercules hook” that is used for hanging objects on drywall material. The hook has a sharpened point on a log shaft that works well in the narrow bone. 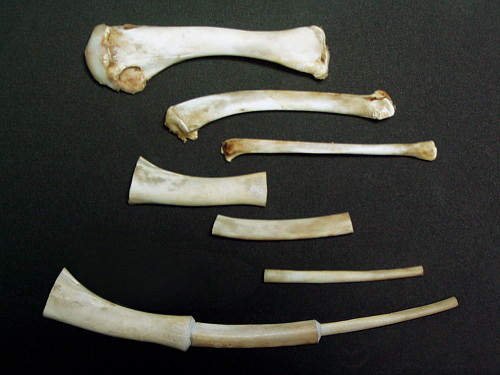 The three bones of graduated diameters will nest in consecutive fashion and may need to be trimmed to accommodate bone circumference irregularities. I chose epoxy putty to seal and glue each joint. A primitive approach would be “abo epoxy” made of pine pitch mixed with carbon ashes. To operate the turkey call place your puckered lips on the tip of the small diameter bone and make a sucking squeak sound similar to the sound that you may make to call a squirrel or small pet. The graduated bone segments act like a megaphone and amplifies the sound so that it is remarkably loud. If you would like to pursue making one of your own calls, Click HERE to view detailed instructions that are excellently written and illustrated by Bernard Dunn. This entry was tagged Bone, Call, Craft, DIY, Hunting, Turkey, Wing. Bookmark the permalink. Thanks for sharing this information. This is truly an amazing work of art.